This article is about an Argentine newspaper. For other newspapers with the same name, see La Nación (disambiguation). La Nación (The Nation) is an Argentine daily newspaper. As the country's leading conservative paper, La Nación's main competitor is the centrist Clarín. The paper was founded on 4 January 1870 (replacing the former publication Nación Argentina), by former Argentine President Bartolomé Mitre and associates. Until 1914, the managing editor was José Luis Murature, Foreign Minister of Argentina from 1914-1916. Enjoying Latin America's largest readership until the 1930s, its daily circulation averaged around 350,000, and exceeded only by Crítica, a Buenos Aires tabloid. The 1945 launch of Clarín created a new rival, and following the 1962 closure of Crítica, and the 1975 suspension of Crónica, La Nación secured its position as the chief market rival of Clarín. Some of the most famous writers in the Spanish-speaking world: José Martí, Miguel de Unamuno, Eduardo Mallea, José Ortega y Gasset, Rubén Darío, Alfonso Reyes, Jorge Luis Borges, Mario Vargas Llosa and Manuel Mujica Láinez have all appeared regularly in its columns. Originally published in Bartolomé Mitre's home (today, the Museo Mitre), its offices were moved a number of times until, in 1929, a Plateresque headquarters on Florida Street was inaugurated. The publishing group today is headquartered in the Bouchard Plaza Tower, a 26-storey Post-modern office building developed between 2000 and 2004 over the news daily's existing, six-storey building. The director of La Nación, Bartolomé Mitre (the founder's great-great-grandson), shares control of ADEPA, the Argentine newspaper industry trade group, and of Papel Prensa, the nation's leading newsprint manufacturer, with Grupo Clarín. The newspaper was part of the conflict between Kirchnerism and the media, when Lidia Papaleo denounced, endorsed by the Kirchners, that they would have been forced to sell Papel Prensa under torture during the Dirty War. Judge Julián Ercolini acquited him in 2016, pointing that there was no evidence to support the claim. In early 2012, La Nación bought ImpreMedia, the publisher of El Diario-La Prensa, La Opinión and other US-based Spanish-language newspapers. On October 30, 2016, La Nación announced a change in its printing format, with weekday editions now being printed as tabloids and weekend editions retaining the traditional broadsheet format. In 2019, the Society for News Design named La Nación as the World's Best Designed Newspaper, sharing the award together with The Sunday Times and The New York Times. La Nación's daily circulation averaged 165,166 in 2012, and still represented nearly 20% of the daily newspaper circulation in Buenos Aires; the paper is also distributed nationwide and around the world. According to third-party web analytics providers Alexa and SimilarWeb, La Nación's website is the 9th and 17th most visited in Argentina respectively, as of August 2015. SimilarWeb rates the site as the 4th most visited news website in Argentina, attracting almost 32 million visitors per month. Cover to #1, 4 January 1870. Building on San Martín 500. ^ "Causa Papel Prensa: sobreseyeron a Héctor Magnetto, Ernestina Herrera de Noble y Bartolomé Mitre" [Papel Prensa case: they acquited Héctor Magnetto, Ernestina Herrera de Noble and Bartolomé Mitre] (in Spanish). Infobae. December 16, 2016. Retrieved March 25, 2019. 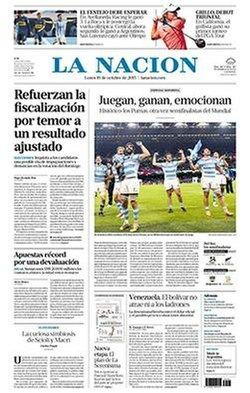 ^ "La Nación, con un nuevo formato: la edición impresa ahora es un compacto", Diario La Nación, October 30, 2016. ^ Wile, Jon (5 April 2019). "World's Best winners in print and digital honored at SND41 opening reception". The Society for News Design - SND. Retrieved 5 April 2019. ^ "Clarín vende un 32% menos que en 2003 y reduce su presencia en el mercado de diarios (Clarin sells 32% less than in 2003 and reduced its presence in the market daily)". Telam. August 30, 2013. Retrieved February 18, 2014. ^ "lanacion.com.ar Site Overview". Alexa. Retrieved 2 August 2015. ^ a b "Lanacion.com.ar Analytics". SimilarWeb. Retrieved 2 August 2015. ^ "Top 50 sites in Argentina for News And Media". SimilarWeb. Retrieved 2 August 2015.